I’ve joined the Bathroom Blogfest again–this is my fourth year for the event that’s in its seventh. 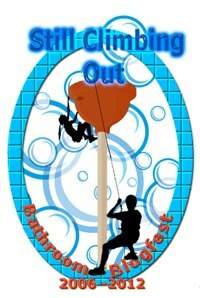 Christine Whittemore, Simple Marketing Now LLC, is directing it as always and asks that we list the blogs of all the other participants so you can see additional interpretations of this year’s theme, “Still Climbing Out.” There are 19 of us this year, listed below the post. Regardless of economy, nobody wants to climb out and dust themselves off from a disastrous bathroom remodeling experience and according to the National Kitchen and Bath Association, [NKBA] there are more bathroom and kitchen remodeling projects than any other and since 2009, more bathrooms go under the knife than kitchens. Before launching such a project, the first place I’d look is Google under “mistakes in bathroom remodeling.” Even if the information is self-serving, written by or for a remodeler or manufacturer, there is often valuable information there. Based on common mistakes, the servicealley website suggested such things as to treat a bathroom remodel like your body [my words]-select a specialist contractor, not a generalist; make sure finishes and fixtures match; take care where you cut corners or you’ll end up paying plenty for cut-rate decisions; don’t install tile in a shower to the ceiling; put your money in the right underlayment, backer boards, sealant and hardware; replace shutoff valves; use a licensed plumber and invest in a bathroom designer. Looking at results of the NKBA 2012 survey, my advice is not to fall blindly for trends. I was taken aback to learn that medicine cabinets are making a comeback. Comeback? Where and why did they go? How could such an essential part of a bathroom, regardless of size, have been replaced by decorative wall mirrors? 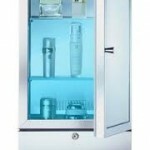 The “NKBA Reveals Top Kitchen & Bath Trends for 2012” Remodeling Market Index continues: “After being specified by 43% of NKBA member bathroom designers leading into 2010, medicine cabinets dropped to 36% last year. 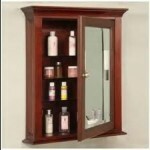 However, as we enter 2012, some 66% have recently incorporated a medicine cabinet into a bathroom remodel.” Spend all that money on everything else and skimp on the medicine cabinet? I’m a fan of interior designers and always have been and hire them myself. But I don’t admire despot designers of any kind, whether of hair style or fashion or home fashion. The one way my way types exist in all industries including healthcare, diet advice, politics, PR and marketing-you name it. I feel sorry for home and apartment owners who are bamboozled into bad decisions that will affect their lives and comfort, the look and function of their home because they think that they must bend to the advisor and to fashion. 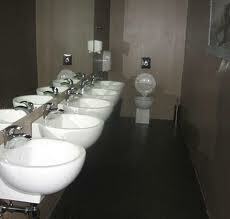 Have you seen or read about similar examples in bathroom design or in other aspects of life? This entry was posted on Monday, October 29th, 2012 at 12:17 pm	and is filed under Blogfests, Remodeling, Uncategorized	. You can follow any responses to this entry through the RSS 2.0 feed. You can leave a response, or trackback from your own site. I hired a good contractor to redo a bathroom several years ago. He, responsible for gutting out the old and rebuilding, and me, responsible for the new design. It worked out very well and outside of the huge mess it caused, tons of fun. Designers are fine for those who follow trends, or don’t want to be bothered, and doubtless most do a creditable job. They are not for everyone – and during harsh times and shallower pocketbooks, for an even smaller crowd. Sounds as though you had the key–the good contractor. Often contractors guide clients to make smart decisions and know more than most where to spend and save money. My problem isn’t fashion but lack of vision. I find it’s true with clothes as well as decorating elements. I might adore a piece of clothing on a hanger. Put it on, look in the mirror and what do I see? Super yech! Similarly I can’t envision what a lot of a pattern or color might look like in a space which is why, when I can afford it, I welcome the guidance of a great interior decorator, one who doesn’t insist on and try to impose a certain look without regard to me and/or my family. You are marvelous! 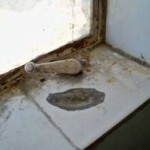 What a marvelous contribution to Bathroom Blogfest 2012! Great advice to start with Google for mistakes, and to run away from despot designers. We have no bathroom cabinet, it wasn’t even an option when we built this townhouse. It drives me nuts and furthermore requires that I waste drawer space to hold an increasing number of prescriptons. Your experience is what I’m talking about. Your house is a stunner–I suppose the contractor thought he/she was saving a ton of money. Not in the right place! Manhattan apartments are often at a loss for space. The old fashioned medicine cabinet that seemed to be partially dug into the plaster was so smart at it didn’t take up any more of the room than necessary while it provided blessed storage. This New Yorker, after most fortunately surviving intact the naturally powerful embrace of “Sandy,” then listened to the city’s very competent, technology savvy mayor tell me, in the interest of keeping the city’s sewer system going, to limit how much I used our bathroom. After this, when in a somber mood, he opened up your latest post about decorating bathrooms, his first impulse was how much better off we were when we had outhouses instead of bathrooms. Admittedly, our population was small enough in those days that nature, using its ever curative powers, unlike now, was able, less violently, to counter balance the damage its diminished number inflicted upon the environment. Likewise, my 18th and 19th century New England ancestors, without benefit of modern technology, for the most part, unless they were killed by the British or the Indians, survived well into their eighties, something, under present circumstances, I am unlikely to do. Of course, it’s not practical to go backwards, but the time has come to worry much less about what our bathrooms look like and far more about what happens to the stuff we leave in them. If our seemingly ever expanding supply of decorators needs to be kept busy, the city can employ them to decorate the sewers or the outhouses of the future, or maybe they can be put to work doing something useful like farming. I am not prone to commenting on the mood of people who are kind enough to take the time to respond to my posts but I would like to guess that you are stir crazy, as a result of Hurricane Sandy, and in a lousy one. Your noting that bathroom designers should decorate sewers reminds me of my reaction to hearing that construction jobs will help unemployment because I think of millions who, for whatever reason, are unable to dig a ditch or hammer a nail….so what do they do? Furthermore, you obviously didn’t go to the summer camp I attended. We had outhouses–and no hot water. We washed in an icy lake [which no doubt is not permitted and for good reason as goodness knows what the shampoo and soap did to wildlife.] My parents paid a fortune for these two months in the Maine woods. The outhouses were far from our cabins and not fun to find in the dark. I’ve also used outhouses on picnic grounds. They are horrible. YECH. Bad idea. Should I have a bathroom to remodel the first person I plan to consult is a designer to save me time, as Lucrezia noted, help me sort through all the choices and determine which savings it’s prudent to take. As for your health, I will drink to it tonight–and to your mood. Here’s to a long one of the former and for your mood, in recognition of the theme of this blogfest, may you climb out of it! You are absolutely right. I am in a terrible mood, but not because of “Sandy.” Rather my anger, and the hyperbole of my comment on your post, is because of my extreme distress that nobody, from our finest leaders on down, seems willing to acknowledge that we are on the brink of a natural disaster of far vaster proportions than just one large storm. They seem even less willing to suggest that we do anything to stop this catastrophe-in-waiting from happening. From our headless and needless headlong hyper-consumption of the world’s natural resources, to our mindless desecration of our environment and the earth’s atmosphere, we are already experiencing a decline in our ability to produce enough food to feed the world’s rapidly growing population. Inevitably, hunger and the subsequent diminishment of habitable lands, thanks to obviously well-underway climate change, will produce massive, literally unstoppable human migrations, which in turn will tear apart those remaining fragile structures of civilization, which so far have yet survived. What will have then? Oblivion, and nobody cares. We’ve got far bigger fish to fry (Yes we still have some fish left, but not for long) than what color to paint the toilet. I don’t think I’ve seen a painted toilet, though no doubt there are some. Sinks, yes. I cover serious topics on this blog, and to a person about to spend many $ thousands on a bathroom remodeling project, the subject of bathroom remodeling is of import, as it is to the thousands involved in manufacturing, installing and up-keeping the products that go into one. Your referring to fish-to-fry reminds me of what NJ Gov. Christie said yesterday when asked about the election when he was absorbing the destruction from Sandy. He said he had bigger ones to fry than the election and that he didn’t care about it right now. He was able to focus on the topic at hand. One step at a time. I also think that Gov. Cuomo hit all nails on the head by recognizing climate change. HOORAY! Climate change wasn’t even mentioned in any of the debates. We’re getting there–though maybe not as quickly as you might like. I suggest, now that the wind has died down and the water begun to go back where it belongs, a nice brisk walk. It’s Halloween–a bit of sweet might cheer you. As always, thank you for your comments. They are important to me.